Beth Shaw, founder and president of YogaFit Training Systems Worldwide, is featured on the cover of Beverly Hills Times. The issue contains an exclusive interview with Shaw in which she enlightens readers with her views on health, fitness, and community service. 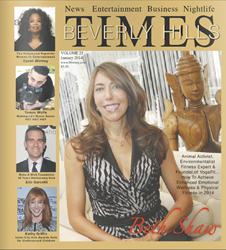 Beth Shaw, E-RYT, BS, CMT, founder and president of YogaFit Training Systems Worldwide, is featured on the cover of Beverly Hills Times’ January 2014 issue. The issue also contains an exclusive interview with Shaw in which she enlightens readers with her views on health, fitness, and community service. Shaw is the innovative educator, entrepreneur, and visionary responsible for YogaFit as well as YogaButt, YogaStrength, YogaCore, YogaLean, and countless other yoga fitness combinations. She has more than 100 DVDs and CDs on the market and is widely recognized as the premier yoga fitness trainer in the industry. In addition to YogaFit, Shaw is a celebrated animal rescue advocate, and works tirelessly with animal organizations with an “Adopt Don’t Shop” mantra of rescuing animals who deserve better lives. Beverly Hills Times is a door-to-door, monthly publication catering to an upscale clientele, with the earning power to purchase whatever they want. With a focused demographic of the 35-80 age group, Beverly Hills Times offer readers an up close and informative look within the pages of our publication that has its roots in the business, news, social, and entertainment of everywhere from Beverly Hills. Read the January 2014 issue of Beverly Hills Times online: http://issuu.com/zakweinberg/docs/bht_january_edition?e=11265507/7159929. YogaFit Training Systems Worldwide was established in 1994 and has since trained more than 250,000 yoga and fitness professionals worldwide. The leader in mind body fitness education, YogaFit is the largest training school for yoga instructors in North America with further expansion ongoing internationally. YogaFit is the American Council on Exercise's (ACE) premier and only yoga partner. Founder and President Beth Shaw is internationally recognized as the foremost authority on yoga and fitness and has been profiled in print publications and television programs including the Huffington Post, Wall Street Journal, Oprah's O Magazine, CNN, The New York Times, USA Today, Entrepreneur, SELF and is currently a New Business Group Member of the New York Times. YogaFit is committed to community service as well as supporting animals and humanitarian causes.